For Malevich, Suprematism was not only a world in its own right, but it was also identified with the creation of a new world, a new man, and a new natural order in the cosmos. 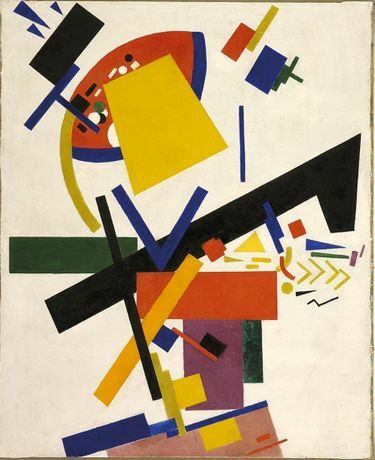 Malevich reversed the traditional relationship between nature and art. He liberated art from imitating nature in order to make an art that he considered to be a force of nature  a force that would be capable of transforming nature itself. Excerpt from the essay Man, Space, and the Zero of Form, Christina Lodder 2012. Christina Lodder, an internationally renowned specialist in Russian modernism and contributor to the Malevich exhibition catalogue, takes us on an hour-long tour of this first major Malevich retrospective for almost 25 years. The exhibition remains open for an hour following the tour to allow guests to explore the work of this deeply radical and influential figure for themselves.